This pull requests fixes #2320 I have done point 2 on the list within the issue. 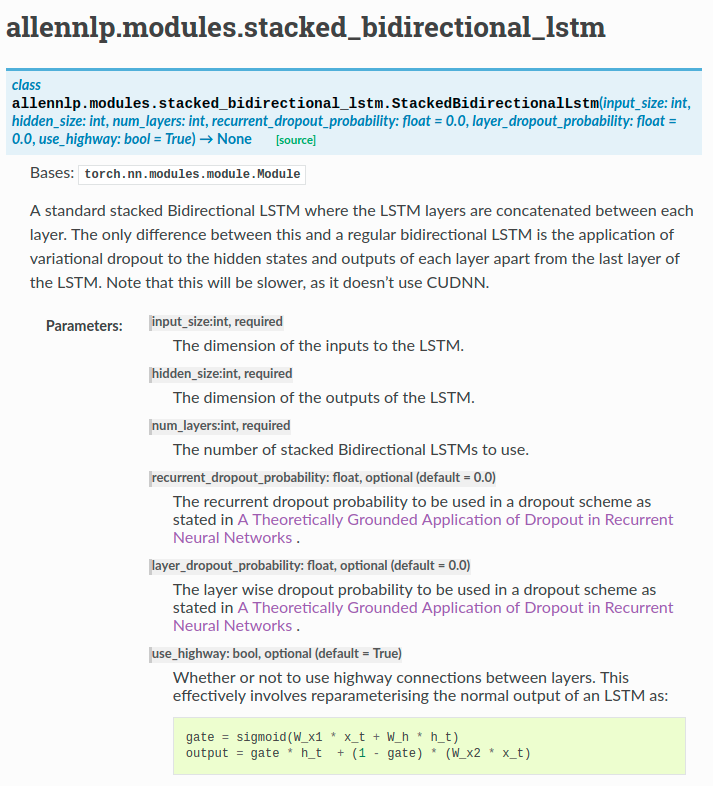 Apart from the points made in the issue I have also added more detail to the doc strings in the [Stacked Bi-Directional LSTM](https://github.com/allenai/allennlp/blob/master/allennlp/modules/stacked_bidirectional_lstm.py) such as the corrected shape of the `final_states` returned form the forward pass and the correct shape required for the `initial_state` argument for the forward pass. 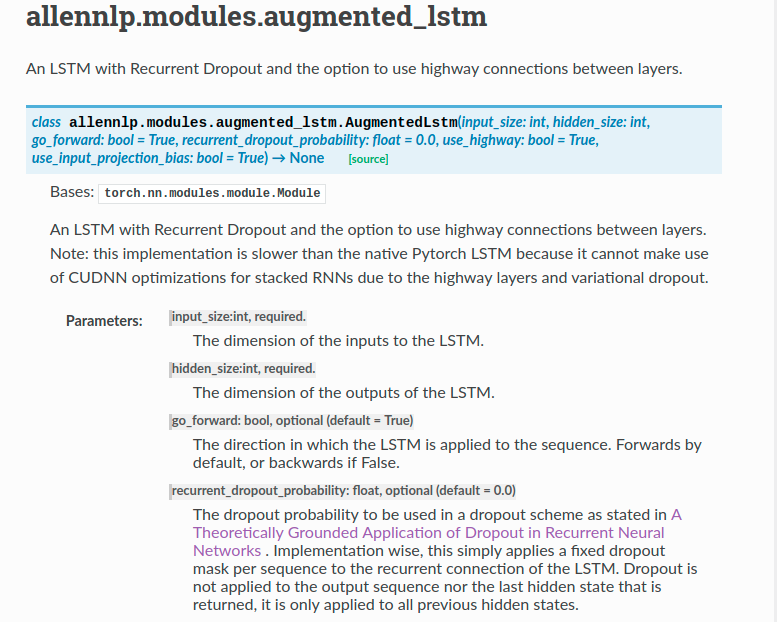 I have also included the returned Type of the forward pass for the [Stacked Bi-Directional LSTM](https://github.com/allenai/allennlp/blob/master/allennlp/modules/stacked_bidirectional_lstm.py). with 126 additions and 16 deletions. state that is returned, it is only applied to all previous hidden states. # Actually get the slices of the batch which we need for the computation at this timestep. # Only do recurrent dropout if the dropout prob is > 0.0 and we are in training mode. # Do the projections for all the gates all at once. # Only do dropout if the dropout prob is > 0.0 and we are in training mode. # relevant elements of the batch into it. variational dropout to the hidden states of the LSTM. Note that this will be slower, as it doesn't use CUDNN. The number of stacked Bidirectional LSTMs to use. Recurrent Neural Networks <https://arxiv.org/abs/1512.05287>`_ . 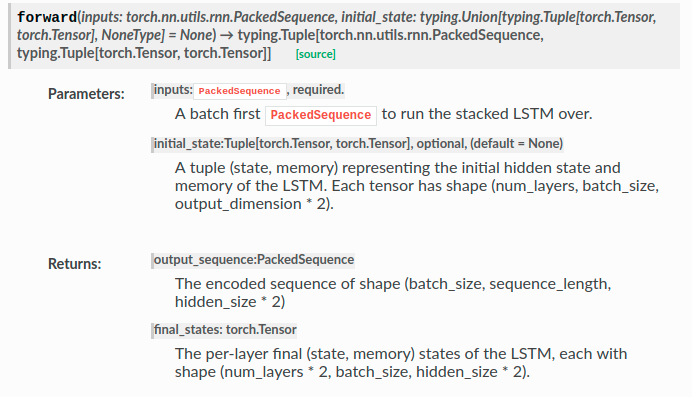 A batch first ``PackedSequence`` to run the stacked LSTM over. of the LSTM. Each tensor has shape (1, batch_size, output_dimension * 2). of the LSTM. Each tensor has shape (num_layers, batch_size, output_dimension * 2). (num_layers, batch_size, hidden_size * 2). (num_layers * 2, batch_size, hidden_size * 2). # consistent with the Keras LSTM implementation as well. # Initialize all weights to be == 1.
input_tensor[1, 4:, :] = 0.